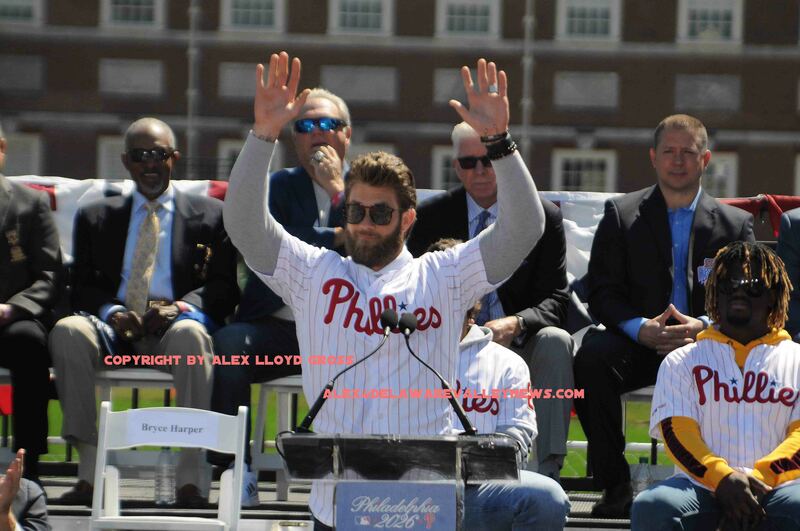 Alex Lloyd Gross- photo Delaware Valley News.com Bryce Harper praises the fans and the city. In 2026 The United States of America will be 250 years old. There is no better place to celebrate it than in Philadelphia. For the Sesquicentennial there will be hundreds of things to do. For one weekend, most probably in July, there will be the All Star Game which will be played at Citizens Bank Park. 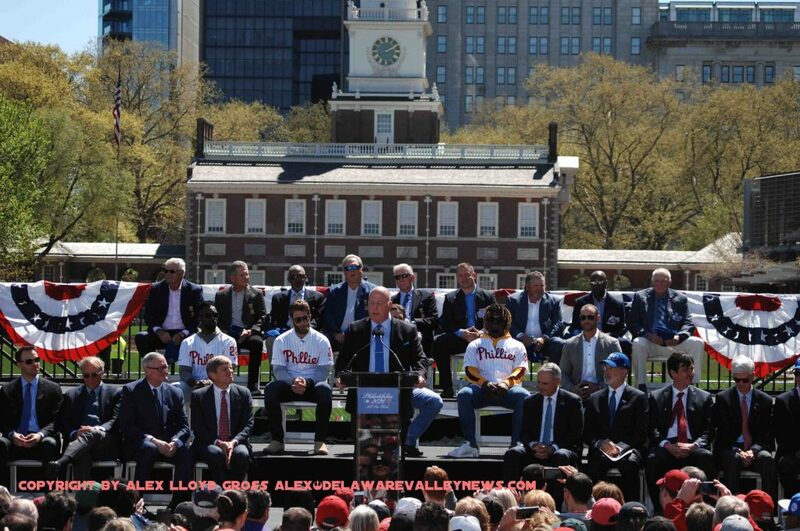 During a public announcement held today, April 16, 2019 in front of Independence Hall, Commissioner of Baseball Robert D.Manifred Jr. made the announcement just after 2:00PM. It was called the worst kept secret of the century. 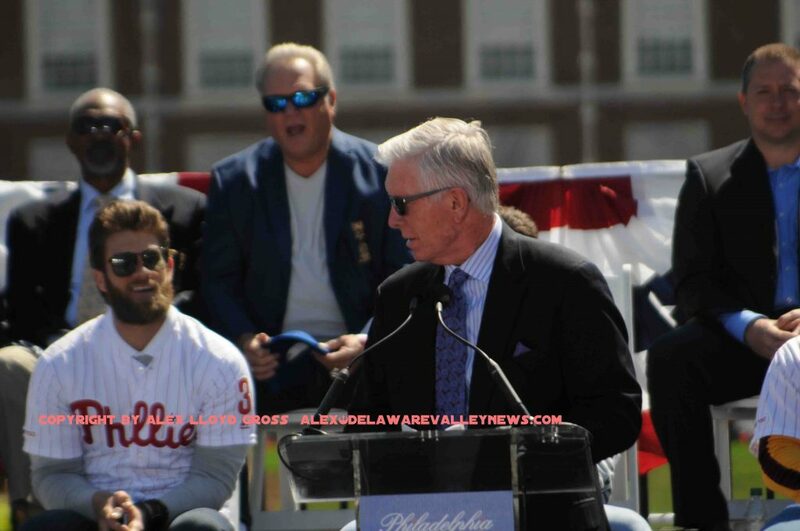 With current players like Bruce Harper and Odubel Herrera watching from the podium, the announcement was made. Seated directly behind them were members of the Philadelphia Philllies who made the All Star Team in 1976. Legends like Mike Schmidt, Greg Luzinski and Dave Cash. The last time this event was held in Philadelphia, it was in 1996 at Veterans Stadium. This event will bring with it millions of dollars to the city by fans who will be buying food and hotel space, not to mention souvenirs. It;s not just the All Star Game. It’s the surrounding festivities that go with it. Events like the home run derby and there will be a Fan Fest, most probably held at the Pennsylvania Convention Center. Tons of things to do involving baseball. This announcement came quick. It’s about seven years away. Already, the logo has been designed and you can expect the city and Phillies to market this incessantly until the opening pitch. Greg Luzinski said that he remembers the 1976 game. “I remember the 7 to 1 win, he said with a laugh as he spoke to the media after the event. Phillies Third baseman Mike Schmidt was asked about the legends doing a walk around the bases. “I think it’s a great idea, I cannot run anymore but , sure, if the Phillies get this going I’d love to be apart of it.” On his feelings towards Citizens Bank Park, he said “I’m jealous. I’ve been on the field, it’s softer, a nice smooth serface. This is a great place to play the game and an even better place to watch a game,”. The exact dates of the 2026 All Star Game have not been announced and probably will not be for a while. You can look for Byrce Harper to be apart of this event in a huge way. He got up and in his brief remarks, praised the Sixers and his new team, the Phillies. It must be noted that the All Star Game was going to be played in Philadelphia in 2026 and that decision was made by Major League Baseball and the Phillies. No one outside of those organizations should be taking credit for bringing this game to Philadelphia.